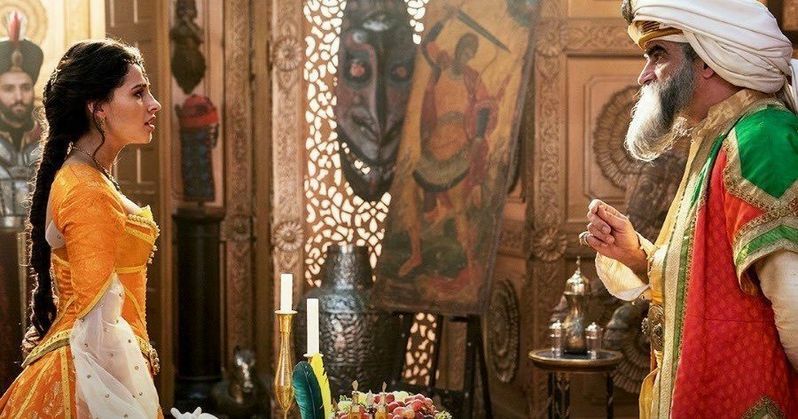 Naomi Scott's Princess Jasmine is featured in the latest image from Disney's Aladdin live-action remake. Scott recently sat down for an interview to discuss the differences between her character in the remake compared to Jasmine's personality in the original animated classic. It appears that we're going to see a much tougher version of the princess this time around. Jasmine has always been one of the stronger Disney Princesses, but we're about to see some changes next year when the live-action adventure hits theaters. In the new Aladdin image, Naomi Scott appears as Princess Jasmine, and she looks to be in an argument with the Sultan as the villainous Jafar appears in the doorway. One of the big changes that Scott lobbied for in the remake was the addition of a female friend for Jasmine. Nasim Pedrad plays Dalia, and Scott has nothing but nice things to say about working with her, along with what her character provides for Jasmine. Scott had this to say about the addition of a new character. "Nasim is now one of my closest friends - she's incredible, she's hilarious and so smart, and we had a lot of fun. To me, it would be doing Jasmine a disservice if she didn't have a relationship that felt like two girls really connecting. If there was a moment in this movie where girls were watching and being like, Oh my gosh, when I'm in that situation, I'd need my best friend and squeeze her and trying not to laugh - all of those little moments, it was so important to have that, and Guy was all about it, he loved that, so we worked together to make those moments really feel Dalia's love for Jasmine, because we all need our girls." As for Princess Jasmine on her own, she begins as a pretty tough character in the Aladdin remake who is fighting for her people. Naomi Scott says that Jasmine is one of her top two Disney Princesses and that she is a "bad-arse" in the remake. Scott also went on to talk about Jasmine's progression throughout the movie. She explains. "She definitely isn't a finished article at the beginning of the movie, but she has this beautiful arc and progression, and she goes from asking for what she wants to really just taking it, and displaying that she is a leader, and that's what I loved the most: Taking something and actually creating something with so much more depth was the most fun and the biggest honor for me, but I'm surrounded by amazing women that I can take inspiration from." Part of telling the story about Princess Jasmine's arc in the Aladdin remake for Disney is her solo song in the movie. Naomi Scott says that the song is about not being "shut down" and being allowed to "speak out," which should resonate with audiences. Scott noted that there's another song in the movie that takes place near the beginning and that it's more of a lullaby. Guy Ritchie's Aladdin live-action remake is going to be looked at under the microscope upon its release in May. Fans of the animated classic have already been critical of the first-look images that have been revealed, mainly because of Will Smith's Genie. The Lion King live-action remake has also run into criticism, so it will be very interesting to see how these new versions are accepted upon their releases. You can check out the latest Princess Jasmine image below, thanks to the DisInsider Twitter account.